If you've read this post and this post you know how the Loerke's like to roll at the State Fair. We try EVERYTHING. 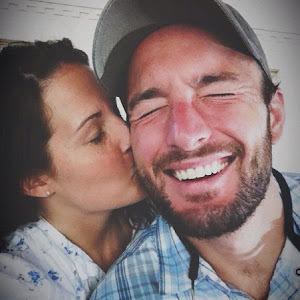 This year was our 7th year of fried food feasting with our dear friend's Mack & Bethany. Between the four of us we ate: Fletcher's Corney dogs*, fried Sauerkraut*, tornado taters, fried buffalo chicken in a flapjack*, deep fried Texas salsa, fried funnel cake fries, roasted corn, sliver fries, fried PB&J, fried bubblegum, a walking taco*, and fried Autumn pie. Can you say, Holy sickness awesomeness, Batman? We also saw the world's smallest horse, this year's winning butter sculpture, watched pig races, played games on the Midway, and saw Boris the 1600lb boar take a nap. 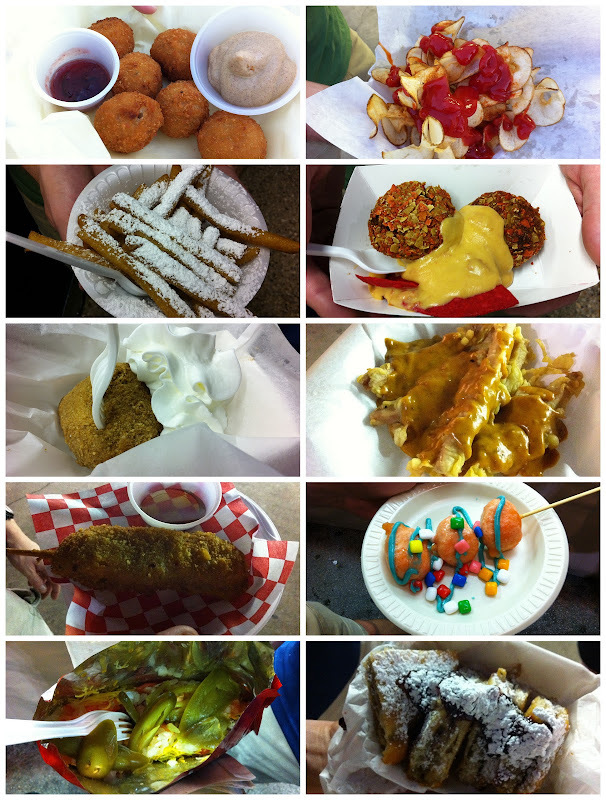 The fried foods listed above with an * next to them were our favorites. Our least favorite was the fried bubblegum which only the boys were brave enough to try. What is your favorite thing to do and eat at the fair? We'd love to know! Oh my goodness, this looks crazy! 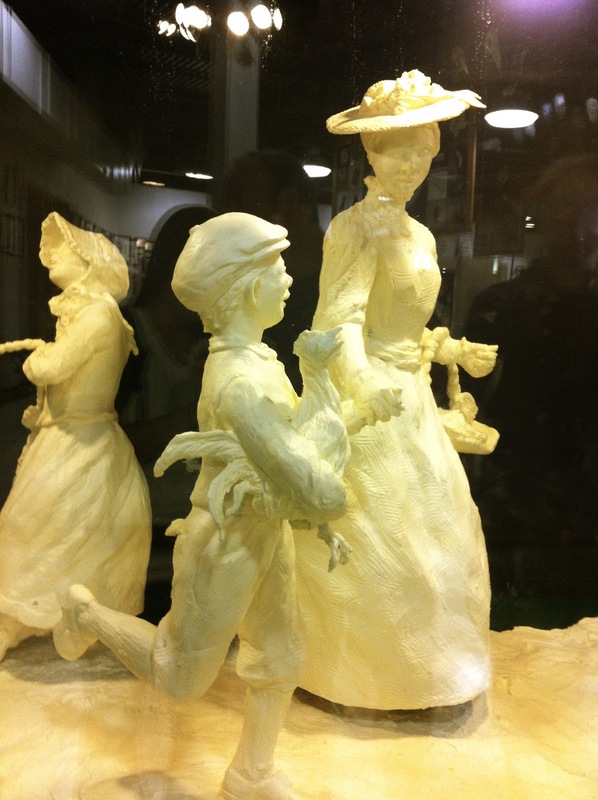 I want to see a butter sculpture in England! I think I need to move to Texas. I tried several times(unsuccessfully)to figure out which was which. It's fair season. I love it. And now I'm hungry. I love this blog soooooooo much so I hate to criticize, but why is there no picture if the world's smallest horse? You guys are so much fun!!! mindy, great question! photos were not allowed in the stable when viewing the tiniest horse. we did find out that it was supposedly worth $48,000. santa vaca! We have attended 2 small town fairs in the last 3 weeks and 1 more coming up in a week and a half...we have eaten: pork-a-bobs, roasted corn, the tornado tators, shrimp on a stick, fwied wice (fried rice) fried boudain balls, hamburgers, kettle corn, funnel cakes and drank lots of fresh squeezed (w/ 1/4c. of sugar) lemonade....I'm a little nauseous thinking about even smelling "fair food" again...but it was YUMMY! Ferris Wheels are the BomB-diggity!!! cod, from the top (left to right): fried saurkraut, tornado taters, funnel cake fries, fried salsa, fried autumn pie, sliver fries (fried hotdog sticks - yuck!) fried chicken in a flapjack, fried bubblegum, walking taco, and fried pb&j. ps, wild child, welcome to texas! We were there this weekend too! I HATED the fried bubblegum. It was too sweet and nasty. I had the fried smore's which were delicious. I've been in Argyle for a month working at a camp. Apparently I came at the right time...I'll be heading to the fair next weekend. 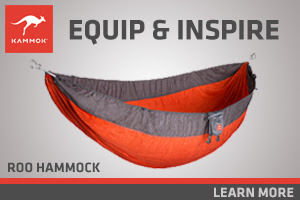 WALKING TACO??? YES! I am all about the corn dogs, corn on the cob, & funnel cakes! 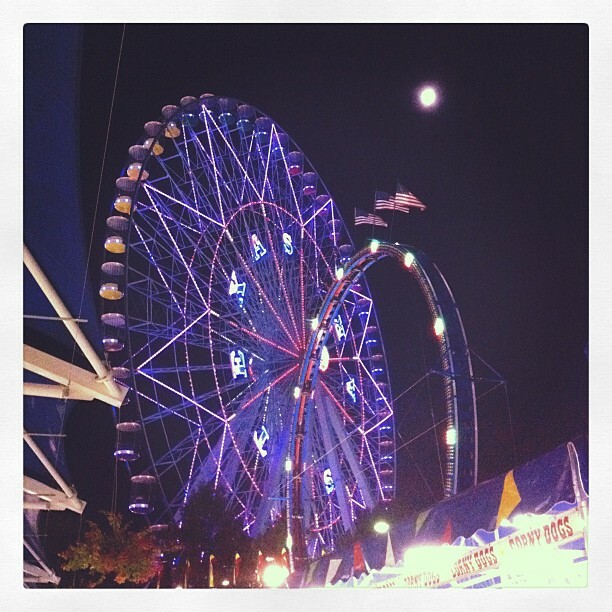 Need to go to the fair with you! MMR, yes to going to the KY state fair with you! Want to see you double fist a Fletcher's.